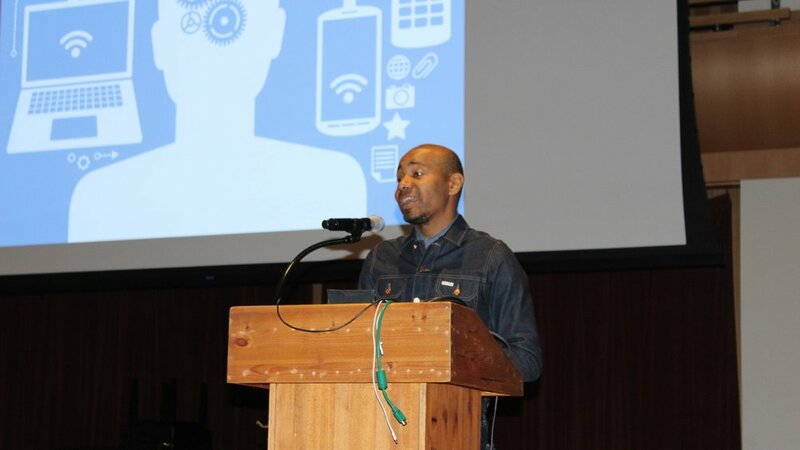 On Thursday, Jan. 31, Paul D. Miller, also known as DJ Spooky, visited Sonoma State University. Miller is a multimedia artist, composer, author, philosopher and writer who composes music of different genres. When Miller came to Sonoma State, he had three events that anyone could attend. The first event held was in Schroeder Hall at the Green Music Center from 12-1 p.m. After, there was a optional luncheon with SSU composer collaborators 1– 2 p.m. where the public could have lunch with him. The third event was a workshop held in Ives 101 from 3-4 p.m. where people could go and ask questions. At the first event in Schroeder, every seat was filled with students and professors excited to see Miller. Miller talked about his books and his app, “DJ Spooky”. The app allows users to create their own tunes, beats and any song remixes they wish to. DJ Spooky takes the opportunity to discuss electronic devices during his lecture on Thurs. 31, 2019. The first book Miller talked about was “The Imaginary App”, which mentions how apps have changed the world and takes an analytical look at them in many various descriptions. The book also explores how mobile apps are being used in everyday activities. Miller said that this book has “all the shortcuts that guarantee direct and immediate access,” Apps are now accessible on many of our devices. The second topic of the lecture series was “The Book Of Ice”, which talks about an ongoing project Miller has been working on. With climate change still drastically increasing, Miller uses Antarctica as a point of entry for observing humanity and thei relationship with the natural world. For his project and to bring awareness on how global warming is changing drastically, he uses his skills to create music that ties in with nature. While he was talking about the book, Miller showed the audience the app “DJ Spooky”. Miller showed the audience a close up picture of a snowflake and the pattern of it and said he recorded someone singing the pattern of the snowflake. He took the person’s voice and recorded her humming up and down to match the shape of the image. With every dip and rise of the snowflake’s shape, so went the singer’s voice. There’s two versions of the app. The regular one is free and the advanced premium version requires a payment every month. Although Miller’s app is not currently available on the app store, he said it will be back on the app store later this year. Events like the Visual Lecture Series, have been gaining attention around campus. “I am very excited to attend more lecture series on campus this spring.” said Katherine Kurtt, a communications major. There will be more lectures throughout the spring semester. Most events will be held at the Green Music Center, including The 36th Annual Holocaust and Genocide Lecture Series.